Wetted Materials: Housing: 304 L SS; Float: 316 L SS. Pressure Limits: lessthan 300 °F, 400 psi (27.6 bar); less than 300 °F, 373 psi (25.7 bar). Dimensions: Tube diameter: 1-1/4 inches (32 mm). Miniature custom level indicators are ideal for high-visibility level indication in tight spaces. All stainless steel housing provides rugged durability with a diameter of only 1-1/4 inches (32 mm). 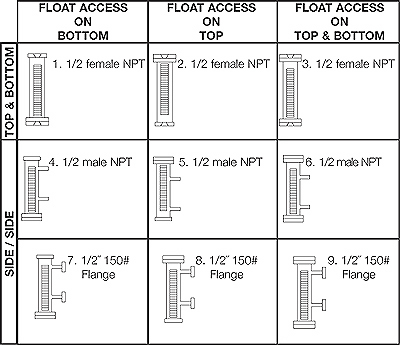 Select the mounting type that will best fit your application and an indication length of up to 96 inches (244 cm). 5) Specify if vent, drain, or both are required. 6) Specify any accessories. Switch modules can be ordered at any time. *Options only apply to connection types 4 through 9 only.